The Jewish-American Hall of Fame (JAHF) celebrates its 50th anniversary in 2019. Each year, an inductee is honored with a two-inch bronze medal. Among the inductees are Moe Berg, Albert Einstein, Levi Strauss, Ruth Bader Ginsburg, Emma Lazarus, Hank Greenberg, and Harry Houdini, to name a few. These medals comprise the longest continuing series of art medals being issued in America. The 2019 inductee is Rabbi Isaac Mayer Wise, the founder of Hebrew Union College and many of the institutions of American Reform Judaism. 2019 is the 200th anniversary of the birth of this iconic American Jewish rabbi. The exhibition features all 50 medals in duplicate, so that the reverse of each can be viewed, as well as displays that chronicle the history and origin of portrait medals; the process of creating the medals from original sketches to clay and plaster models and dies; and text and video about the accomplishments of the inductees. 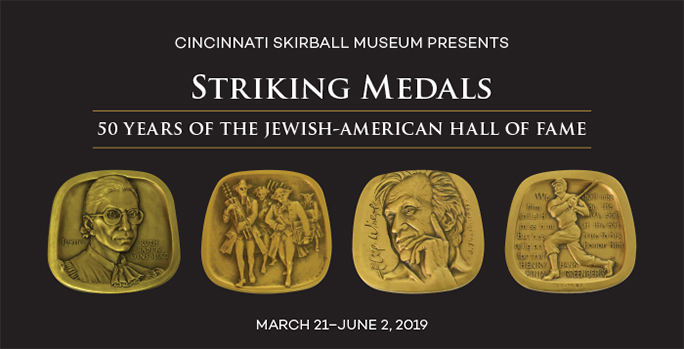 Also featured in the exhibition are several special commemorative medals marking significant anniversaries in the history of American Jewish life. This year’s commemoration of HUC founder Rabbi Isaac Mayer Wise takes on profound significance as we celebrate the 200th anniversary of his birth as well as honor distinguished alumni who have served the Reform movement for 25 years. Jewish-American Hall of Fame founder Mel Wacks as well as descendants of Isaac Mayer Wise will join us as this iconic figure takes his place as the 2019 inductee into the Jewish-American Hall of Fame. This year’s final student Broadway concert on Clifton will pay homage to a panoply of Jewish American songwriters and Broadway showmen whose songs we all know, among them Jewish-American Hall of Famers Leonard Bernstein, Irving Berlin, and George Gershwin. This concert is sponsored by the Wendy Kanter Fund and the Skirball Museum. Spend a little time at the Skirball Museum before the concert between 1 pm and 3:30 pm! Skirball director Abby Schwartz and Jewish-American Hall of Fame founder Mel Wacks will be on hand for informal conversation about musicians and entertainers in the Jewish-American Hall of Fame. Join Skirball Museum director Abby Schwartz for an informative slide talk over a casual lunch. Learn about the process of making the medals in the exhibition and hear about the achievements of some of the inductees. Gallery walk and talk will follow. In commemoration of Jewish American Heritage Month and the 200th birthday of HUC founder Isaac Mayer Wise, the Skirball, AJA, and Klau Library will open their doors for tours of their respective exhibitions that pay tribute to this iconic rabbinic figure in the history of American Jewish life. A reception at 5:30 in Mayerson Hall will be followed by brief tours at each venue. Come celebrate with us! Enjoy the last chance to see Striking Medals. Museum staff and volunteers will be onsite for informal tours and conversation. Learn about the process for making the medals on view as well as the important contributions of the inductees to American history, society, and culture. Programs are free and open to the public. Visit huc.edu/strikingmedals to register online.